Anyone who has watched The Simpsons with any interest has likely noticed that Troy McClure and Lionel Hutz no longer appear, not as speaking characters or even silent background extras. The show’s higher-ups retired both characters after their voice actor, Phil Hartman, was murdered by his wife in 1998. McClure and Hutz aren’t the only Simpsons characters to have their associated actor pass away, however. In 1995, longtime script supervisor and occasional voice actress Doris Grau died of respiratory failure, effectively ending the run of two cartoon characters to which she lent her trademark emphysemic voice, Doris the Hairdresser on The Critic and Lunchlady Doris on The Simpsons. Granted, it’s not as tragic an ending for Grau, whose death came as a result of the cigarettes that gave her the voice that made her famous, but it is nonetheless strange to me that The Simpsons initially retired and then ultimately brought back Lunchlady Doris despite the death of the person most strongly associated with the character. 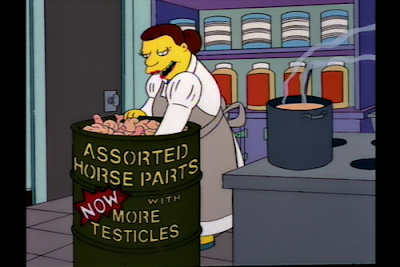 more testicles mean more iron! Grau’s voice is heard for the last time in the 1997 Simpsons episode “Lisa’s Sax.” Then her on-screen counterpart appears as an unvoiced background character until 2006, when Lunchlady Doris speaks again in the episode “The Mook, the Chef, the Wife and Her Homer” but voiced by Tress MacNeille, the cartoon superstar who also voices Agnes Skinner, Cookie Kwan, Lindsay Naegle, Brandine Spuckler, the Crazy Cat Lady, Mom on Futurama, Gadget from Chip ‘n’ Dale’s Rescue Rangers, Dot Warner on Animaniacs, Babs on Tiny Toons and ten-thousand other lady cartoon roles from your childhood. Amazing though MacNeille may be, it seems strange and comparatively insulting to Grau’s memory to have revived Lunchlady Doris — a character who is arguably more closely associated with the original voice actor’s real-life persona than McClure or Hutz are with Phil Hartman — and allow her to be voiced by someone else. But The Simpsons did it nonetheless. And when I watch the reruns, every appearance by Lunchlady Doris (whose full name appears to be Doris Freedman) or a Lunchlady Doris-sounding character only reminds me that the real, original Doris died long ago. Which is awkward. And not so funny. So maybe retire the Lunchlady Doris character, Simpsons showrunners? Or at least stop making Tress MacNeille voice Lunchlady Doris and Lunchlady Doris-like characters? I dunno, I've managed to remain a Simpsons super fan despite the fact that being a Simpsons nerd has long since stopped being a relevant type of nerd, and this never bothered me. It would bug me if they tried to bring back one of Phil Hartman's characters for a speaking role, (even though Billy West does a pretty good job, as evidenced by Zapp Brannigan) but honestly I think it would be kinda cool if they canonically killed off his characters too, which I think most people would get really upset about. So I guess I'm saying I'm more lenient than most Simpsons fans I know? I actually catch most of the new episodes, whereas most of my friends have all but disowned the series. Well, it's not that Lunchlady Doris's continued speaking roles enrage me or anything, but I am puzzled as to why she wouldn't have gotten the same treatment as Hartman's people. The new episodes? Not all that bad. Sometimes quite good. Never as great as seasons three through seven, but what is? I wonder where Doris Freedman comes from? Wikipedia has her as Doris Peterson. I don't recall either name ever being used on the show. So Matias and I went to see Conan and Andy (mostly Conan) get interviewed by Patton Oswalt a week ago. It was a very entertaining evening, particularly after they got completely wasted and cracked jokes for three hours and Conan ended up sitting on the edge of the stage giving random people hugs. ANYWAY during Q&A someone asked about the Monorail episode of the Simpsons, which Conan wrote. You know how Spock makes random appearances in that episode? Apparently Conan originally wrote that part for Sulu, aka George Takei. They called him and he refused, because he was on the board of the LA Transportation Authority or some such organization and refused to mock the monorail. Someone suggested Spock instead and Conan thought, "There's no way he'll do it. He's a much higher ranking officer." But they called Leonard Nimoy anyway and 5 minutes later he was in the show. Sam: I've no idea where the Freedman came from. The main Simpsons wiki ain't what it used to be --- and indeed may not actually be the same website --- but I don't recall an episode where we were given any reason to think Doris had a last name. Dina: Did not know that. How interesting. It may be worth pointing out that Takei used to do a voice on the show but they stopped needing him when they realized that someone already on staff could do Takei's voice just as well. There's a minor recurring character, Akira the sushi waiter, who still shows up now and then and sounds like Takei with a Japanese accent.